I did not get an invitation to the event yesterday morning, but I saw it on tv later. By the time I got there – early afternoon – everything was calm and peaceful again. see www.cbc.ca/news/canada/british-columbia/irate-kits-reside… for raw footage of the interview. It was not broadcast in its entirety. Affleck made himself look very silly by announcing that if an NPA Council is elected this year, this scheme would be removed. 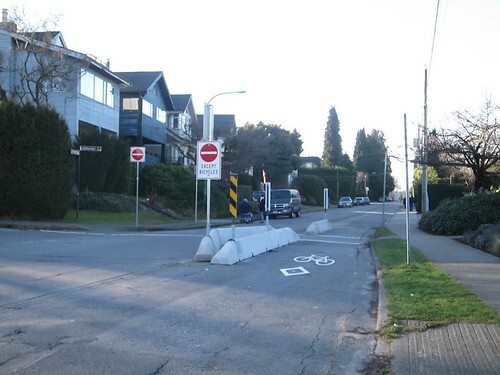 Deciding that removing through traffic from a residential street will not work before the idea had had any time to be observed seems foolish. He will of course be proved wrong simply because of the law of urban traffic – it expands and contracts to fill the space available. 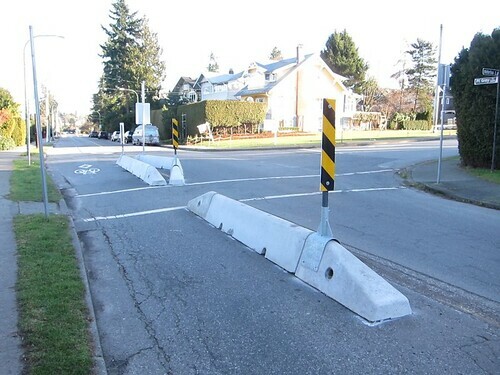 Just as protected bike lanes on Burrard Bridge – and elsewhere in downtown – have not produced the traffic disasters predicted for them, neither will this one. 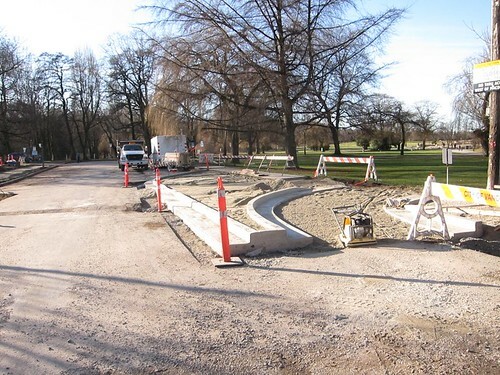 Life in this neighbourhood will have been improved considerably – the connection of Tatlow Park to Volunteer Park across what is now a street is a brilliant idea and one which has been requested by the people who live in and visit the area for many years. The map below shows what has actually been implemented. It really is very modest. For people driving cars, there is still access to every property, park and facility. The map is from the City web site and there is also an explanation here. Even so I saw one car driver decide to drive the wrong way along the one way section and another make an illegal right turn through a No Entry (except bikes) sign. Quite what actual impact doing a U turn at high speed is supposed to convey I have no idea. Shouting at the flag people who were protecting city workers installing the new traffic devices seems even sillier. UPDATE I recommend an article in Huffington Post by a local cyclist which looks into the realities of bike lanes versus the politics. 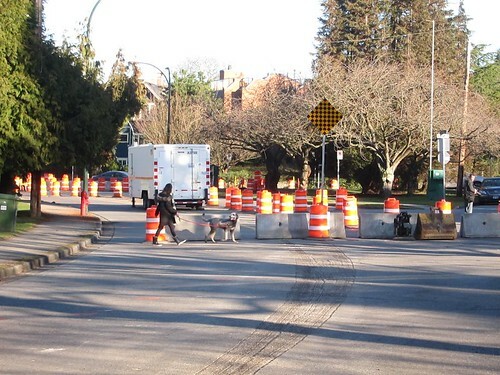 Point Grey Road was never designed to be an arterial. The road became a “rat run”. 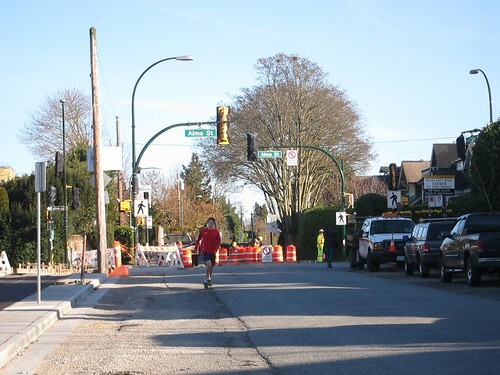 Using Alma as the connection it allowed people moving between the western end of West Side to avoid 4th Avenue to get through Cornwall to Burrard. It wasn’t actually much faster if you drive at legal speeds. 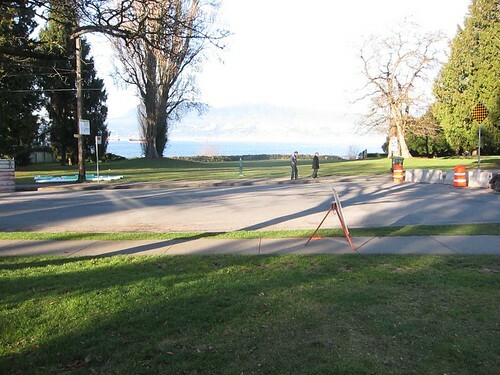 Point Grey was already signed at 30 km/hr – and no-one seemed to comply with that. The process of adjustment to the loss of what was seen as a “short cut” will be rapid. Within the next few days, trip making will have been adjusted. Suggesting otherwise is an insult to the intelligence of the drivers! 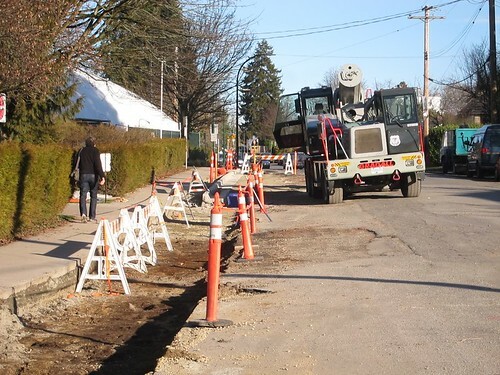 The international experience (rtf) of evaporating traffic (pdf) is extensive. Angle parking to the left has been removed and replaced by the bikeway which then turns into the park to connect up to the seashore route. The reverse angle to the previous shot. It looks like the angle parking will be eliminated – except perhaps for the lifeguards. There is a turning area at the the dead end, and paid parking (summer only) to the left. Traffic diverter: eastbound vehicles must turn right (south) only bikes can proceed. Westbound traffic can proceed or turn left. At this point I observed a woman in an older car drive straight through on the wrong side of the road. 2:51pm – and I have never seen this road at this time of day this quiet. 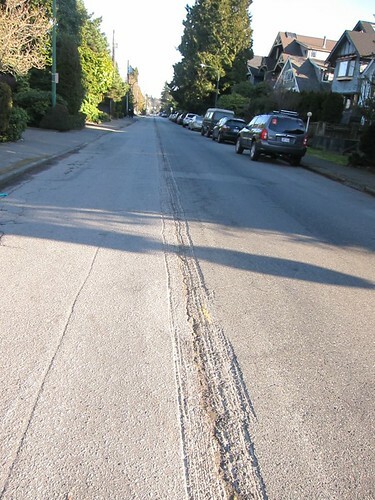 Traffic calming for residential streets in other cities is something residents demand – not protest about. 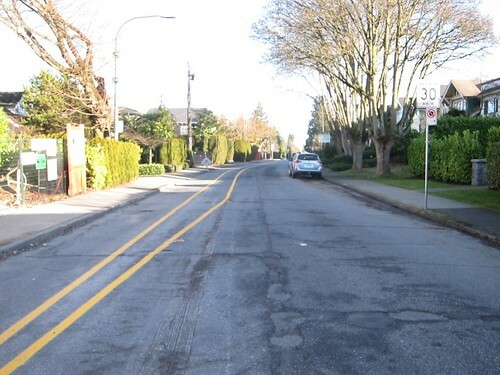 The NPA line is that this road belongs to all the citizens of Vancouver and hence anyone should be able to drive on it whenever they feel like it. Talk about a lot of angst over nothing. 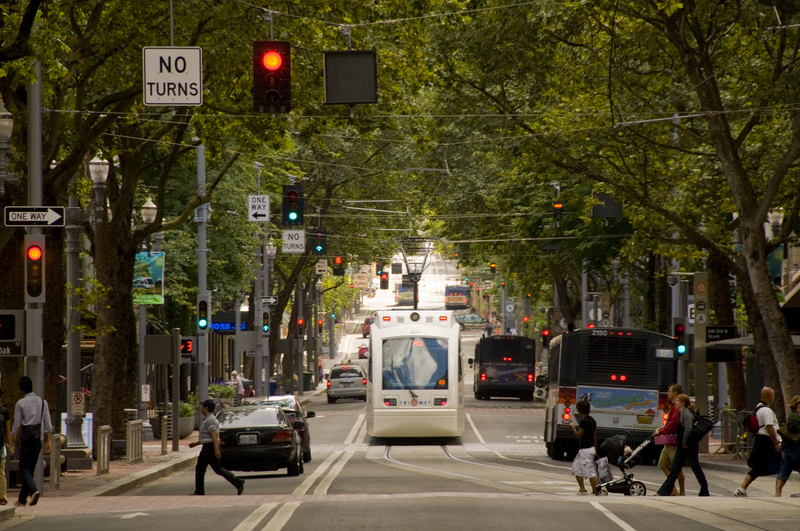 Residents of the area should be celebrating the peace and quiet, cleaner air and nice boost to their property values. How long until the city replaces those highway dividers with something more attractive, like a true curbed median. The warzone ambiance surely can’t help with pro-bike PR. The approach adopted in New York City was based on paint and oil drums – then gradually upgraded to more permanent features once it is clear to everyone that the new arrangements work well. Possibly some interim adjustments are needed – but are easy to do before more permanent arrangements are made. 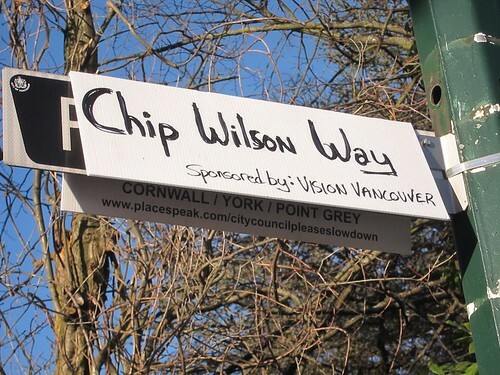 Vancouver now has plenty of experience of what does and does not work. 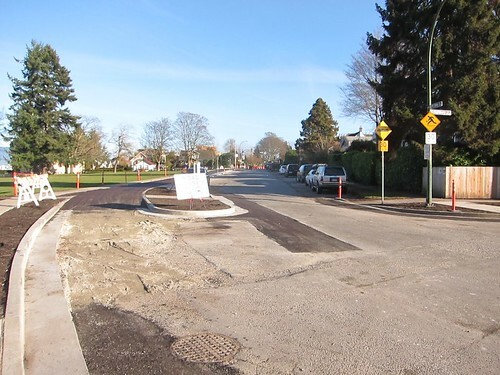 However, there are still lots of traffic circles – which manifestly do not work – and not many roundabouts which work very well indeed (see for example UBC W16th and Wesbrook Mall). For experience with bike lanes see the Huff Post article I inserted a link to above. Nice to see this! 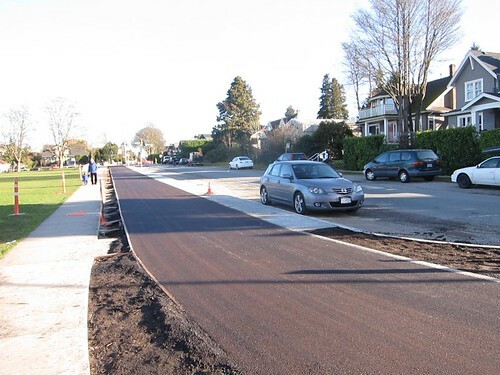 Here in Nanaimo (where traffic is by comparison already much less) there are similar issues of non-arterial roads being used as shortcuts, i would love to see those changed to no-through streets or selective one way, etc. 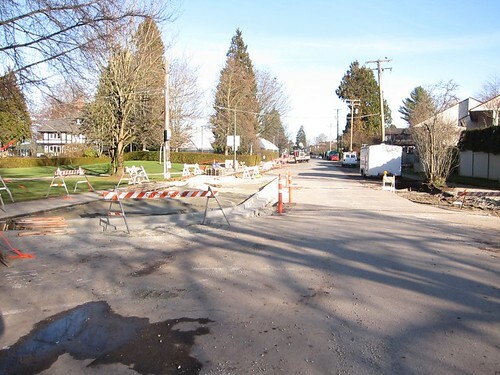 Meanwhile the city is widening an existing arterial road which currently operates far below capacity, adding a connector to an adjacent highway, and in the end it will mean more traffic of course, and people taking newly available “shortcuts” through previously quiet residential areas. madness. 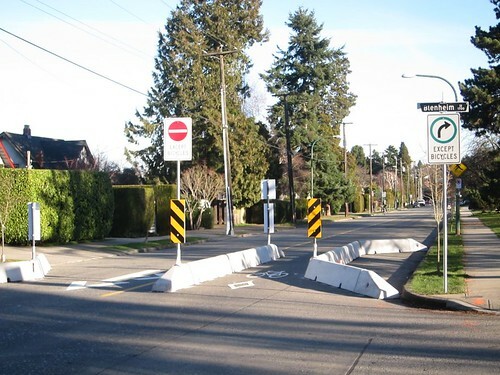 The City of Vancouver has been doing traffic calming to deter through traffic from residential areas for many years. Most of the West End of downtown has diverters diagonally across intersections and short stretches of pedestrian only streets. The traffic circle at Wesbrook and 16th is laughable. A nice idea but horribly implemented. Other than that I agree with every point you have made Stephen. I think it is very sad that you do NOT understand the difference between a traffic circle and a roundabout. Try this link to help you understand why your comment is so ill informed. I think the roundabout at UBC is intimidating for casual cyclists, including anyone who’s too timid to take a lane. 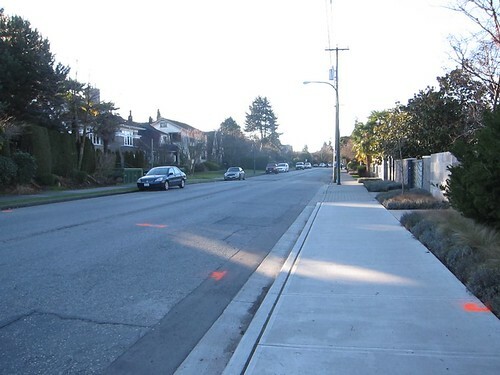 It is rather sad that there are still people in Vancouver that are totally unaware—in 2014– that thousands and thousands of towns in Asia, Europe, the Middle East, South America, Australia, New Zealand and even some towns in the US, have adopted all sorts of traffic calming and traffic reductions solutions, car-free areas and more, starting, for many, in the late 60s-early 70s. And its not as if all these towns didn’t have lots of cars..they do..but their citizens have eventually understood that the right of driving a car anywhere, anytime, in a town wasn’t written in their country constitution. I can’t wait to ride the new route! Sure, there are already bike routes from Cypress to Jericho, but the zig-zagging route is bumpy (poorly maintained road surface) and, as you move further west, dangerous at intersections. 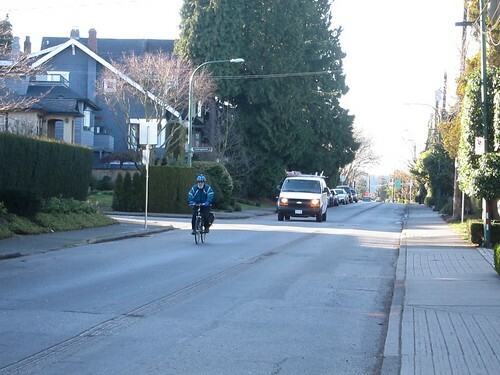 When it gets busy, the street is sometimes too narrow and fraught with dangers to allow cyclists a safe passing distance between each other (especially if you’re riding two by two), let alone throwing cars into the mix. I’d forgotten about the lack of safety on that route til I saw your pictures and realised how thrilled I’m going to be to have a safe — and beautiful — path to ride on. They do get a higher volume throughput. And they do it without the splitter islands on each arm and the yield signs which make the well designed roundabout distinct from the traffic circle. Roundabouts do work. Traffic circles don’t work. You can see well designed roundabouts working at UBC. 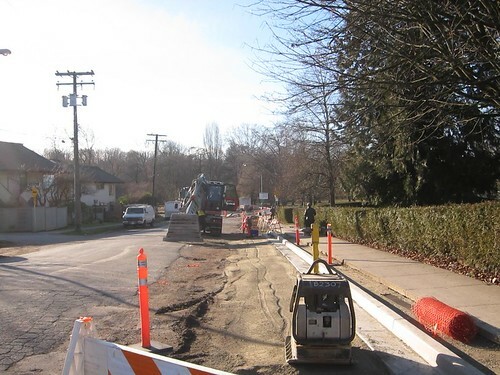 They work because they have yield signs – traffic must not enter the circle until it is clear. Traffic circles are based on the false notion of “give way on the right” i.e. traffic in the circle has to give way to those entering it. Instant gridlock. 4 way stop is based on the idea that all road users are idiots who must follow every rule to the letter even when it makes no sense. You are supposed to stop even when there is no other traffic in sight. Roundabouts assume that people are capable of judging a safe gap in the traffic. 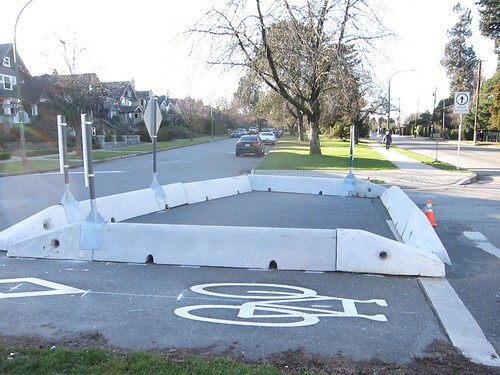 As long as roundabouts are properly designed this gap acceptance idea is intuitive. 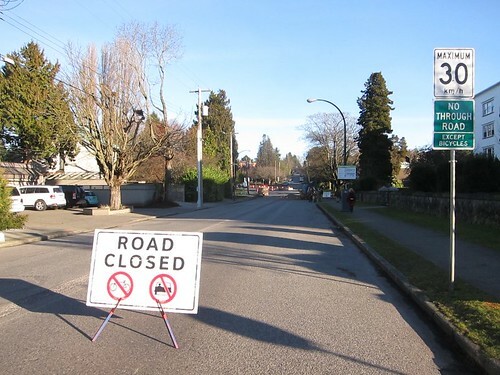 For a total failure see also right turns at freeway exits that are supposed to be free flowing onto the intersecting street – Highway 99 southbound at Steveston Highway for instance. The turn off the freeway has no sign or line across the road as there is one lane westbound across the bridge which becomes two lanes where the traffic leaving the freeway joins it. Idiots stop there. Even if the volumes were not higher, roundabouts are better than four way stops because not only are collisions less in number, but those collisions are now glancing blows not T bones, so much less severe.